While not quite as good as the Cities & Knights expansion, Sefarers is still a good addition. Play a few different scenarios, and you will probably find that it has some pretty fun twists itself. Super fun extension! 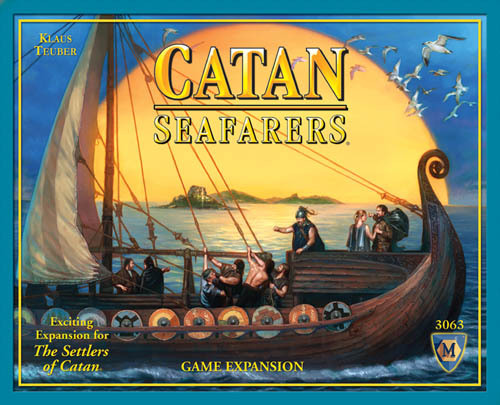 Takes the basic idea of Catan and adds the fun of ships & a pirate! Not a stand alone game, however. You do have to have the original Settlers of Catan. Great addition, adds gold to the different resources (even though we do not usually play with it at times it seems a little overpowered) The islands and different possibilities of lay outs makes this one a very fun expansion. Back in grad school, my buddies and I would play Settlers every weekend. We loved the game and so when this expansion came out we added it in and found that it was a great enhancement to the game. I particularly like the scenarios that allow you to explore and discover new oslands. The gold mines are a nice addition as well. Fun expansion that is easy to learn. If you've become tired of the same old settlers set up and game, be sure to give this expansion a serious look. There is essentially no downside to picking this game up as I can't think of any negative effects that this would have on the game. Give it a try today! The addition of boats and water tiles may seem lacking at first, but you will quckly see the game-play changed and affected drastically, and for the better. The separation of water, the islands and especially the "gold" producing tiles make this expansion a must-have for Catan-enthusiasts! This is nothing less than a great expansion to Settlers. I love the way you get more variability through the new tiles and the fact that they include 7 scenarios that you can choose from! Since I introduced this to my gaming group, the basic Settlers game has been gathering dust. Add seas and ships to catan! !Make the possible board configurations endless, as well as adding a few new rules related to the islands and ships....a great game!